Wrought iron balusters can give your house the ultimate upgrade. Staircases often serve as the focal point of your home; so a little makeover will go a very long way! We offer an assortment of iron baluster pieces and accent decoration that suit a variety of styles and tastes. With so many elaborate baluster designs to choose from, you can get as creative as you wish. From intricate to simplistic, you can craft a collaborative look that will make any staircase shine. If you want to improve the look of your stairs with high-quality iron balusters, but would like to tackle the project yourself, we’re here to give you the steps you need to do just that. Our tutorial will give you a breakdown of the necessary steps to help you remove existing wood balusters to replace with stunning wrought iron balusters in your desired style. To get started, we’re going to tackle the basics to help craftsmen of all skill levels. Let’s go over the different parts of a staircase, shall we? First we have the newel, which is also known as the center pole that serves as the support system for both the handrails of a stair banister and a spiral staircase. The baluster, which is our main focus, is a column or pillar that is often ornamental that is aligned in a series that supports a rail or coping. The handrail, or banister, is secured to the staircase to offer support for people to hold onto as they are using the stairs. The next step involves materials. 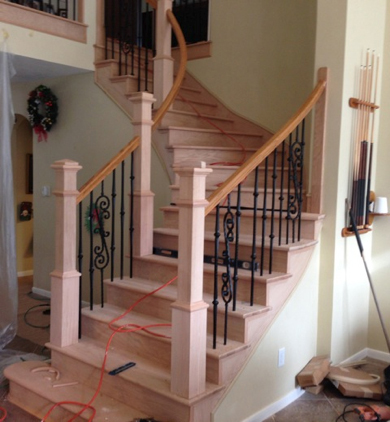 To get started, you’re going to need iron balusters that will replace your existing wooden set. 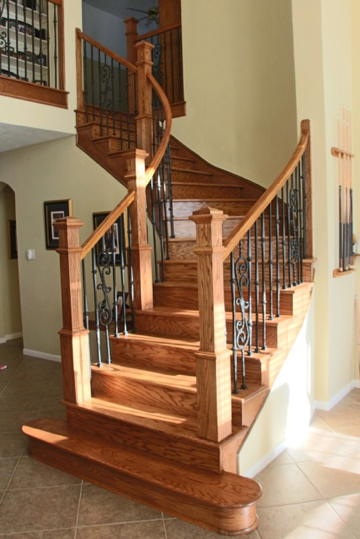 At Indital USA, you can choose balusters that reflect your one-of-a-kind vision and exquisite taste. The Hammered style features eye-catching hammered corners, chiseled rough edges, and patterns that twist and turn. To take a more contemporary approach with your staircase design, our Modern or Art Deco styles point to the future while also embracing qualities of the past. From geometric accents to organic embellishments, there is a design available for every project. Although you will be replacing the balusters, it isn’t necessary to change the bottom post on your wooden railing. Leaving the existing post will actually allow your railing to remain as stable and durable as it was. Cover the surrounding furniture, and get ready to cut! Using a jig-saw or reciprocating saw, start cutting the wood balusters in the middle. Make sure to grip the existing balusters while you are cutting to avoid any damage to the railing. Once you’ve cut the wooden balusters at the center point, begin to twist and wiggle the pillars to loosen them. The balusters might be nailed or glued, depending upon the design of the staircase. 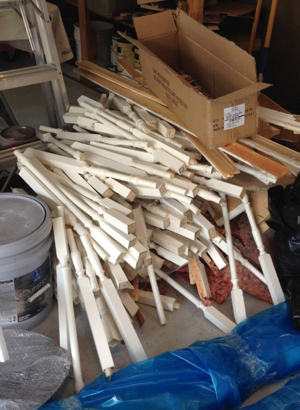 Once you’ve removed the existing balusters, look around for glue, fillers, or nails. This is when you can use your pliers to clean the area. After removing and cleaning up the area, you can use your existing rail to be your guide for the spacing of the new balusters. You can also mark new placements for the rails in accordance with codes using a tape measure and a pencil. Begin to drill holes according to the placement that are no deeper than 1-1/2” on the rail and the step. It’s imperative to cut the new iron balusters approximately ½” longer than the distance from the step to the rail to accommodate the insert part of the pillar into the rail and step. Cut from the bottom to size based on the rake of the steps. Be modest when it comes to cutting and take it step-by-step. Never start cutting at the top of the baluster. Using your high-grade, thick two-part epoxy glue, prepare the area with enough glue in both the top and bottom holes to stabilize the new baluster. Time for your new wrought iron balusters! Place the upper shoe on the baluster before inserting, and place the pin-top end of the baluster into the rail first, and then follow with the bottom portion by inserting it into the tread after inserting the shoe. Next, you want to adjust and tighten the shoe to securely fasten it against the tread. Shoes usually come with screws for securing against the spindle. If this is the case, use an Allen wrench to fit the shoes to the tread. 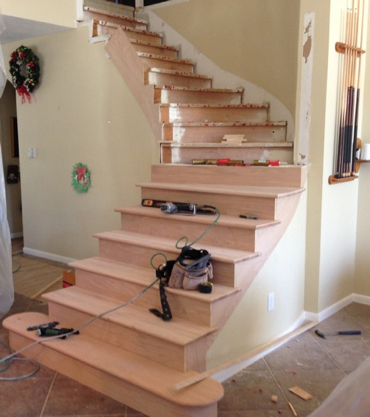 Once the epoxy sets, which can take around one hour, your new staircase can be revealed! Enjoy the dramatic difference iron balusters can make to the design of your home. The hard work will certainly pay off!